Notes: The Type 6 was fielded in the 2360's in order to introduce several modernizations to the shuttle fleet. 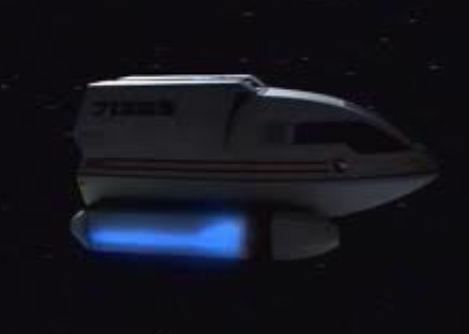 It was the first shuttlecraft in service with a Duranium/Tritanium hull, and also introduced isolinear computer systems into shuttlecraft service. In order to avoid introducing too many radical changes in one step, the designers based the structure of the Type 6 on the venerable Type 3 design. The aft section, comprising the impulse engines and other major engineering systems, was identical to the Type 3; the midsection was deleted from the design, and the forward section was heavily modified in order to provide the flight crew with a wider field of view and accomodate the new computing and sensor systems; even so, the new forward end had to fit the existing Type 3 aft end and so there remains a close similarity in overall form. The Type 6 proved to be quite popular with pilots in service, and many hundreds where produced during the twelve year production run. Eventually Starfleet decided to cease production of the Type 6 in favour of purely modern designs, and the last Type 6 was delivered from the Utopia Planitia fleet yards, which manufactured these craft, in 2368. The type is now gradually being phased out of service, though it will undoubtedly remain a feature of many hangar bays for some time to come.